Time to talk about some beautiful Swedish food. Max Burger, in my opinion one of the best places to try for burger and fries lovers. 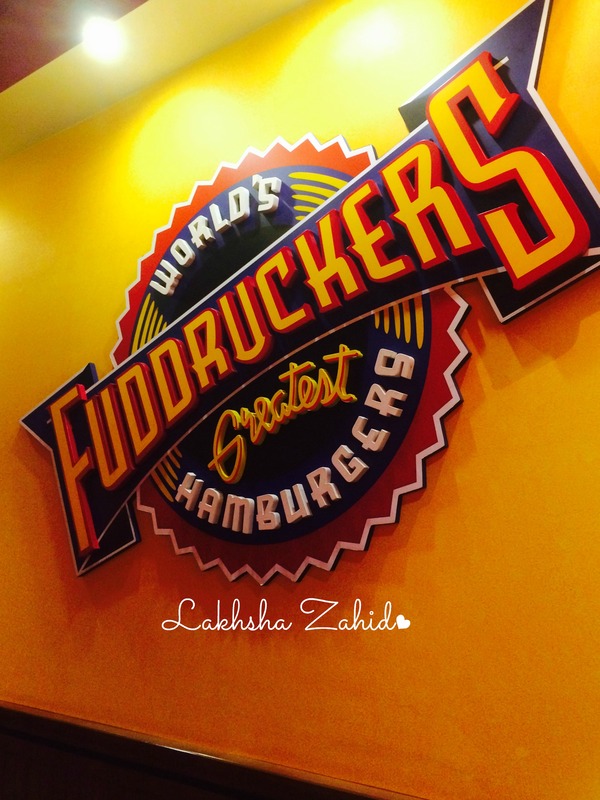 Loving it since it began, I am a huge fan of how unique yet tasty their burgers are from other similar franchises. A lot of places kind of serve the same typical burger taste but with max burger you get a very different feeling. (that’s what I felt) Everything always seems to be on point and there is never a time I am left disappointed, I always leave full and happy! Hello Everyone!! Sorry I’ve just been a bit too busy, and I finally sat at home today to do my blog .. Well, let’s forget about it, I’ve got something new for your weekend. 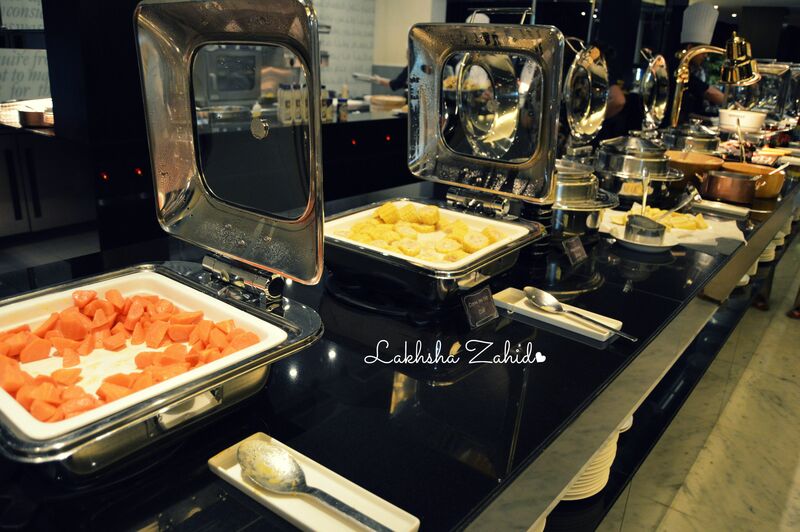 How about a Brunch this Friday, with your family? Well, not just a brunch, you also stand a chance to win something great! Give your try at the Spin and Win Wheel, and win something exciting with Pullman Hotel. How about you spend your lazy friday from 12pm to 4:30 pm there? I went for the ‘Little Suzie’s Friday Brunch’ at the Medley Restaurant, located at first floor of Pullman Hotel Dubai, Deira City Centre. 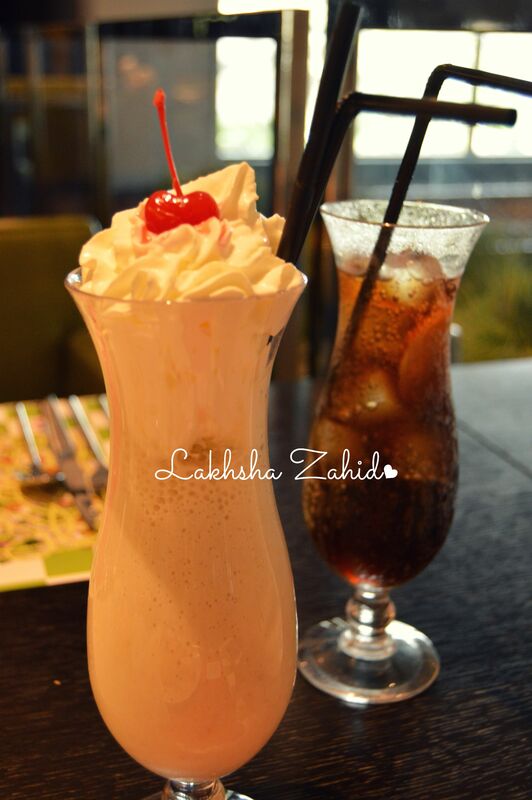 Price range starts from; 199 Dhs with soft beverages and milk shakes. Under 6 children go Free! To start off with the food, well it was filled with so many things, I hadn’t seen so much food in a long time! 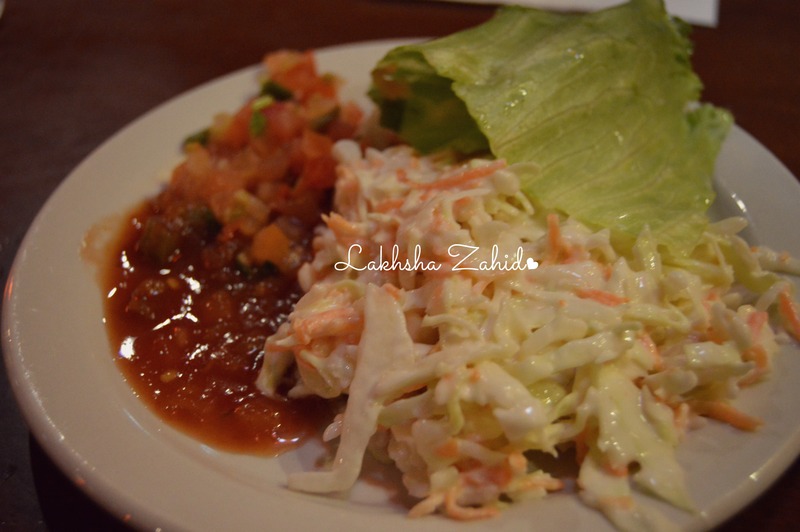 They had a wide range of Salads, Desserts, Drinks, Milkshakes, Burgers and so on! 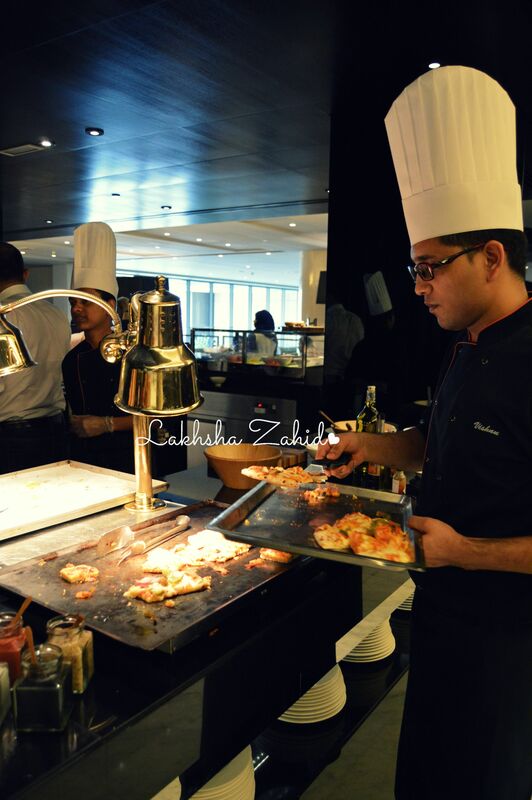 The buffet table was lined up with various dishes such as Mashed Potatoes, Chicken Wings, Corn on Cob, Mac & Cheese, Barbeque Ribs and much more.. 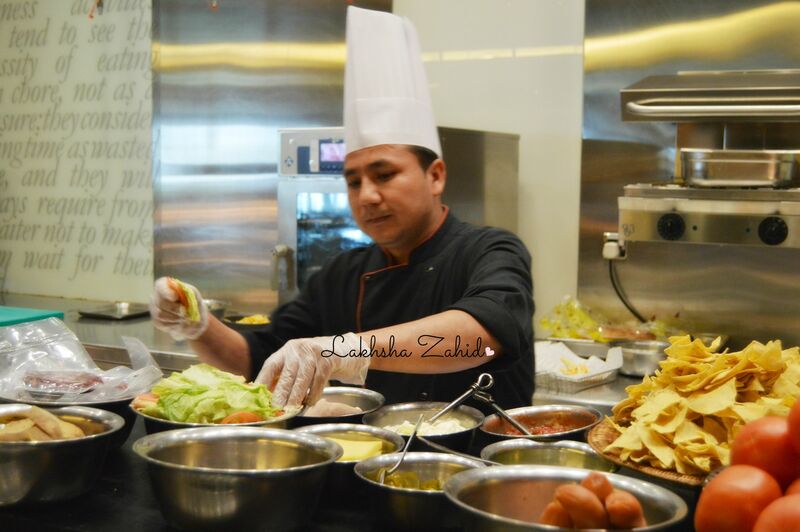 The Salad corner, almost consisted of each and every thing, every type of Salad you’d need you will see there. 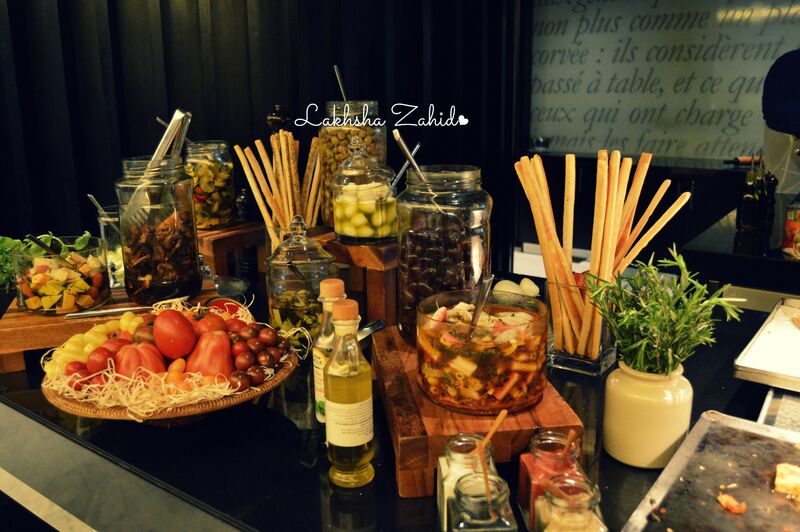 Olives, tomatoes, cabbage, creamy potatoes, corn, carrots, onions, olives, lettuce and many more.. There was also a place, where you could go up to the Chef and ask him to make you fresh food like Burgers, Hot Dogs, Fries.. I had some Nachos with Cheese and Salsa, they didn’t taste bad. Not to forget the Breakfast corner with waffles, pancakes, bread etc! I had some Nutella with a fresh bread. The kids corner is absolutely cute, a small kiddie buffet, with gummy bears, jelly beans accompanying them with some amazing cartoon shows on TV! They did have a lot of fresh juices, tea, coffee, cold drinks, milk shakes! I tried the Banana Milk shake, and had Pepsi of-course! The taste was good, but I think the milk shake could be little improved as it was watery! The desserts were endless and the most perfect I’d ever see or eat! 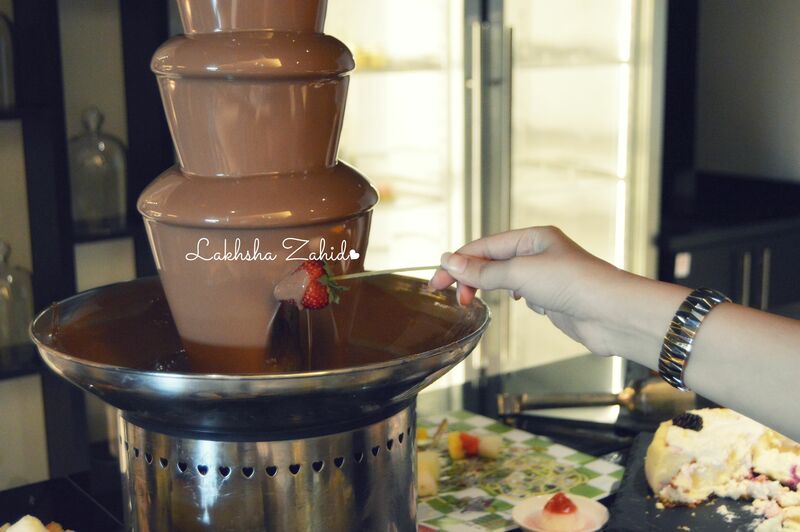 Starting from my favorite which is no other than chocolate fountain, with various fruits on stick! I only happen to love strawberries, and unfortunately they were over, and the staff was so good, that they got me so many strawberries! I thought I’d be going home depressed without having my favorite strawberry dipped in chocolate but oh thanks to them! & Oh, what’s best I got to experience it myself! Moreover, there were various cupcakes, cakes, brownies, tarts, pastries and in many different flavors! The staff was extremely friendly and co-operating.The waiters were well-dressed and gave an outstanding service, also the waitress who was dressed up like Little Suzie and served food in skates (YES, this was something really new to see)..The parking available is Valet, so don’t worry about your parking issues. It’s always best to do the booking well in advance, so you can be seated immediately. Last but not the least, before you leave the restaurant, don’t forget the Spin & Win Wheel, you can win anything! I’m for sure visiting again! Are you? Thank you for reading, do give me some feedback! So as I entered, the staff greeted happily, and gave me my comfortable seating. As of then I started to think what really to order (I’m always confused when it comes to food), I’m not really a vegetable person at some places. Looking through the menu with those mouth mouth-watering appetizers, and side orders. Well, then i went to the Toppings bar, (which is free, and unlimited) Tomatoes, Pickles, Onion, Salsa, Cheese, Mayonnaise, Cheddar Cheese etc! 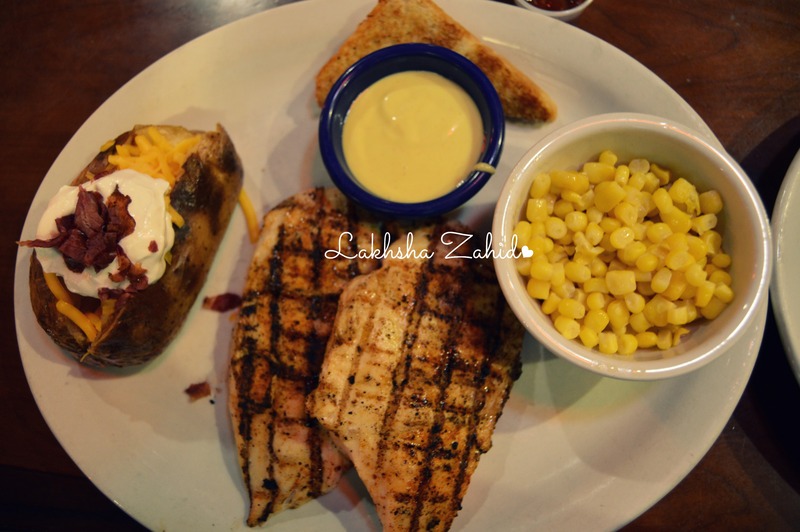 I tried the Cajun Chicken Platter which included of two chicken breasts with Cajun spices along with Baked Potato and Sweet Corn! Its just 55 Dhs, and that’s pretty much affordable you know.. It was freshly cooked, and hot, so delicious to eat! The platter included with a bread piece and sauce also! 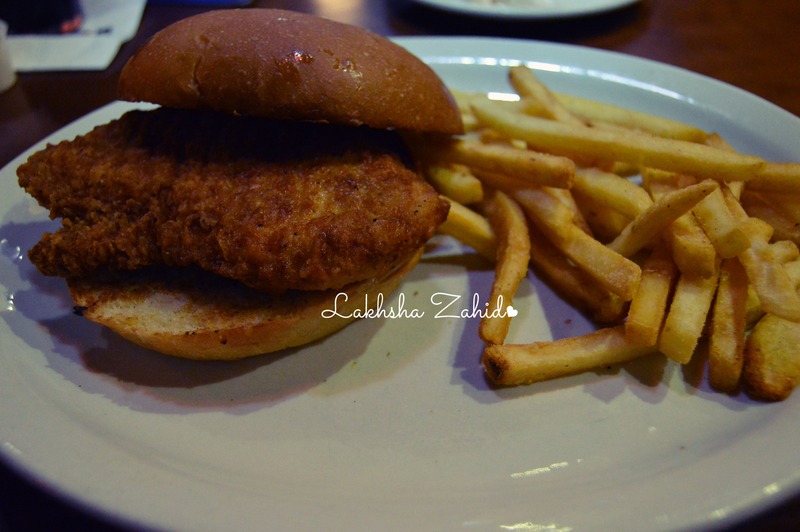 Then, I tried the Crispy Original Chicken Sandwich, this is basically empty because its your choice of toppings. So i added up Mayonnaise, tomato, fries and ketchup and the taste was perfectly amazing! 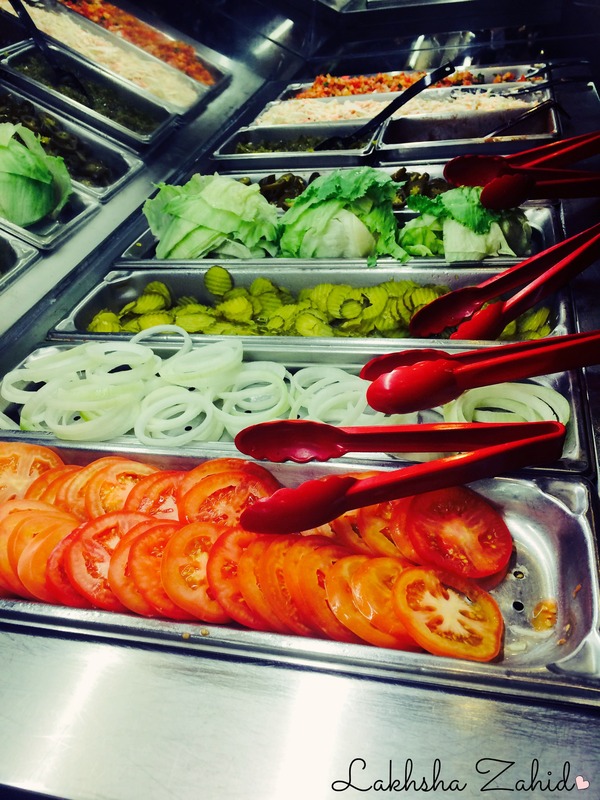 You can add your choice of toppings from the bar! This costs 37 Dhs! 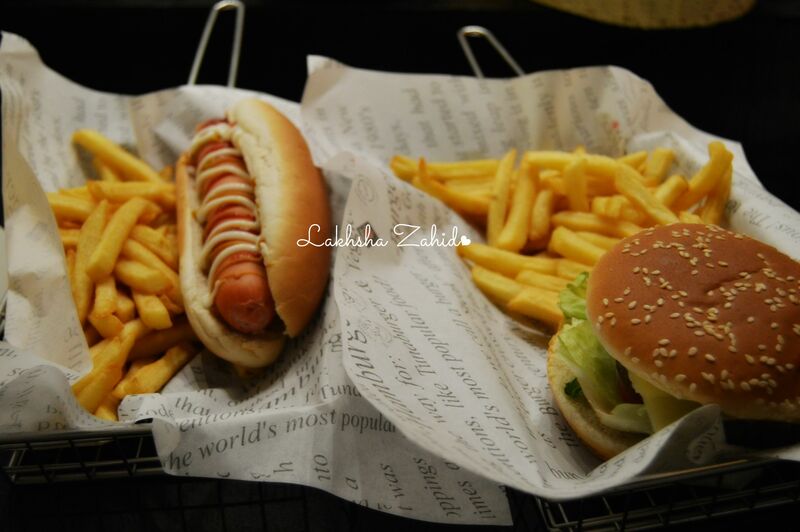 This is only in large size and comes with french fries else potato wedges! Obviously, I didn’t eat all of this alone, I was so full! I walked out with a huge smile & filled stomach! It’s a family restaurant, so next time do give them a visit! I’m sure you will love the food! Have any restaurant in mind you want me to review about? Please leave your suggestions to me! Thanks for reading!